Our fifth wheel trailer is 10 years old now, and we’ve been living in it full-time for most of those years. Our RV toilet has been with us every step of the way, although over the last few years it has struggled to hold water in the bowl. 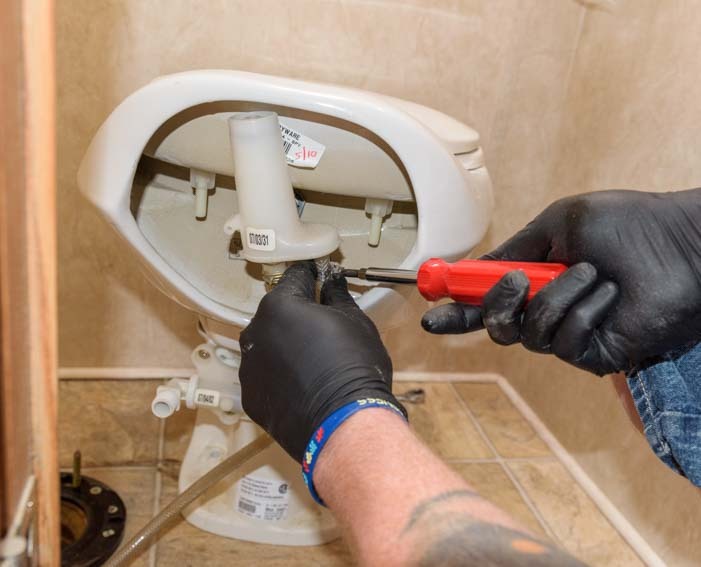 Last week, out of the blue, Mark put his foot on the pedal to flush the toilet, heard a loud snap, and then the toilet flapper valve refused to budge. It was completely broken and unable to open and flush properly. Ugh!! Luckily, the toilet bowl couldn’t hold water any more either, so it was kinda able to flush, just in a dribbling sort of way! So, our delightful plans to go play in the dunes at Great Sand Dunes National Monument in Colorado were dashed, and we drove off over the horizon in pursuit of a replacement RV toilet. 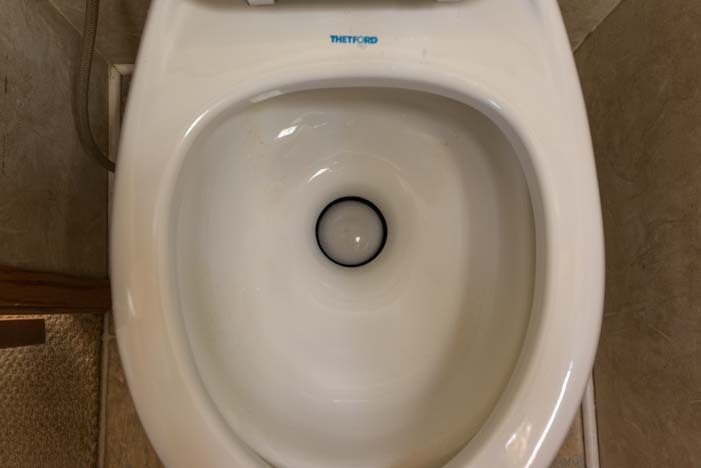 the flush valve in the toilet bowl. Fluids dribbled out quickly anyway… Not good! After some calling around, we found a shop that had our exact Thetford toilet in stock, and when we arrived, there it was on the display rack! What luck! There is an identical toilet on the display rack. We have an RV Extended Warranty with Wholesale Warranties that has been a huge help in dealing with the many surprise financial blows we’ve faced as our trailer has aged and various components have quit working. We first got our warranty in October of 2014, and by Christmas of the following year it had paid for itself several times over as we faced one major repair after another, all in a row. Unlike vehicle insurance, which protects vehicle owners against accidents, an extended RV warranty protects against failures of the systems in the RV that aren’t caused by a mishap. There wasn’t a whole lot of space to work in our little toilet room! 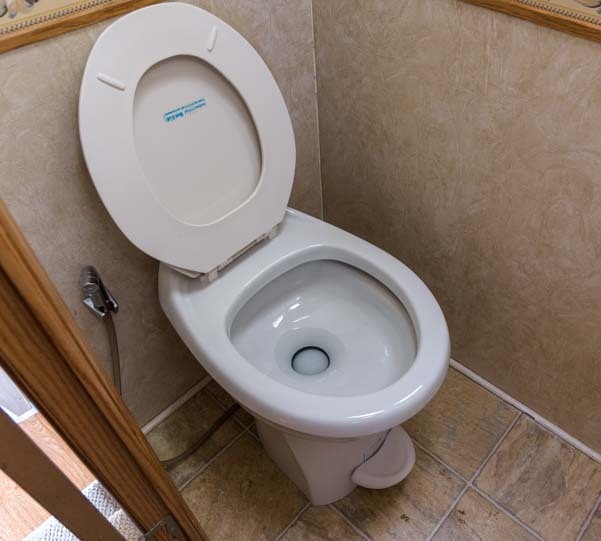 We learned from our last RV toilet repair job that replacing broken parts in an RV toilet is often more expensive than simply swapping out the toilet all together. So we weren’t surprised when the service manager said he wanted to replace our toilet rather than troubleshooting the problem and disassembling and reassembling the toilet to replace the broken part. 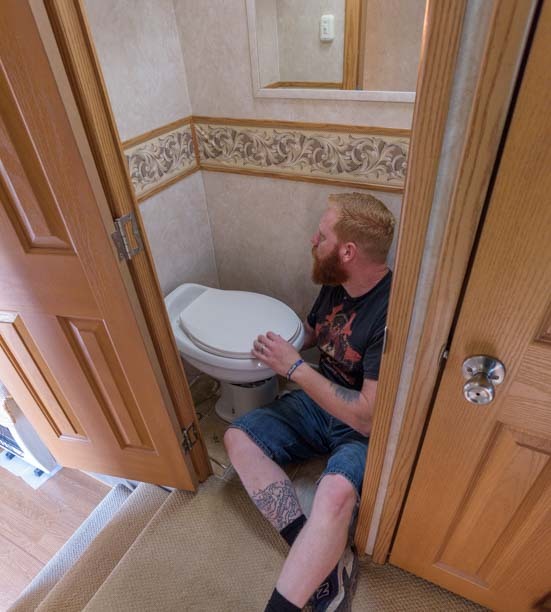 He called our RV warranty company and explained that the toilet couldn’t flush and that the flushing mechanism was broken. The warranty company agreed to cover the toilet replacement in full. 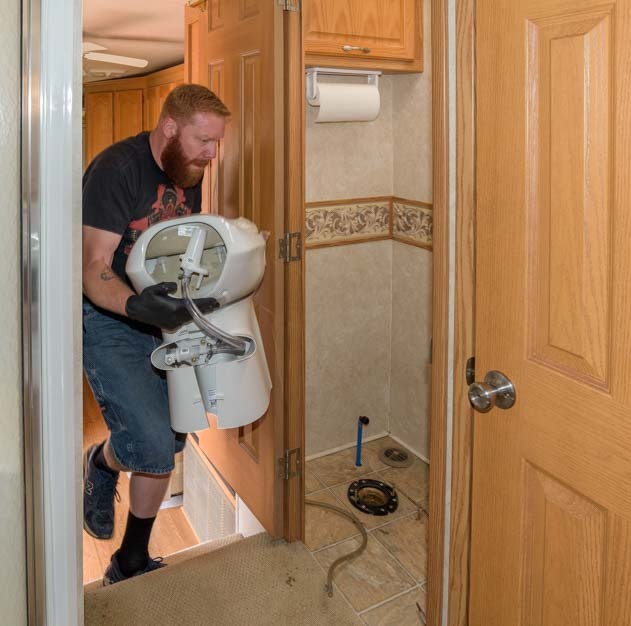 To get started, the RV technician removed the shield around the base of the toilet and then unscrewed the two large bolts that hold the RV toilet to the floor. 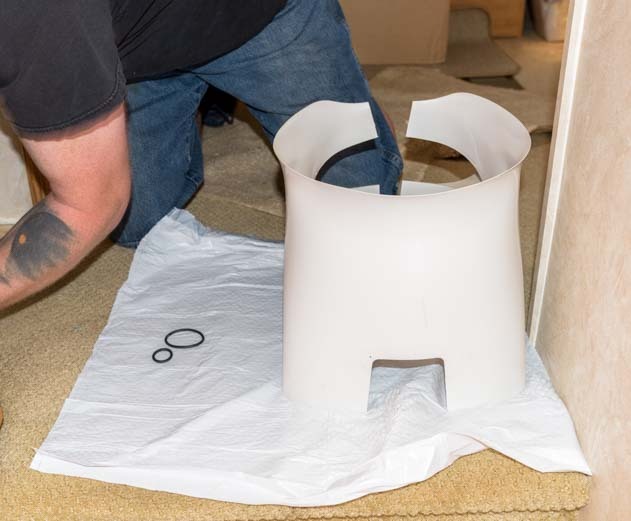 The first step to removing the toilet is to remove the shield from around the base. 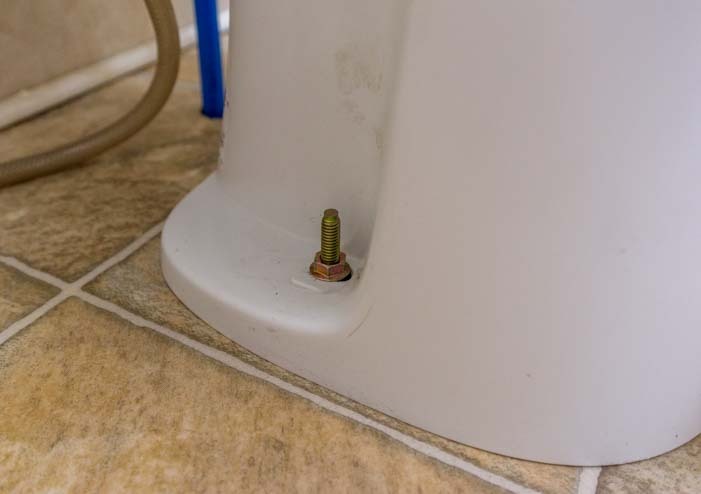 Two bolts — one on either side of the base — hold the RV toilet to the floor. Then he detached the fresh water line from the toilet and pulled the toilet off of the hole in the floor that goes to the black tank underneath. The toilet is removed from its position over the sewer drain hole that goes to the black wastewater holding tank. The hose clamp for the fresh water rinse sprayer is removed. After pulling out the toilet, all that was left in the little toilet room was the hole in the floor that goes to the black wastewater holding tank, the blue fresh water line that fills the bowl and flushes the toilet, and the fresh water spray wand with its flexible hose (this was an option on our old toilet and didn’t come with the new toilet, so we kept the old spray wand). 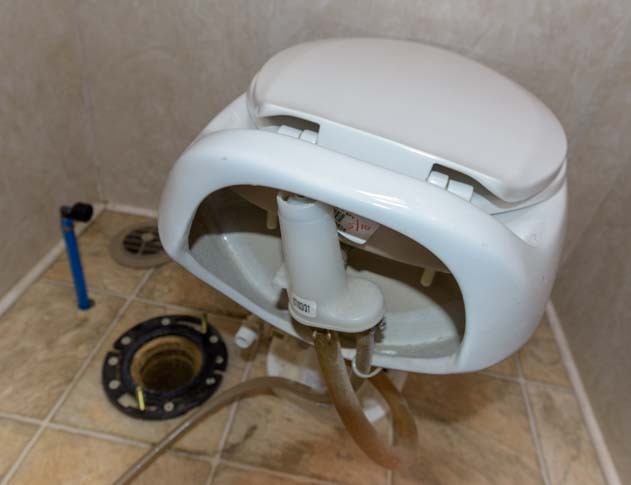 After the toilet is removed, all that remains is the black water sewer hole, the blue fresh water flush pipe and the flexible fresh water sprayer hose. Then it was out with the old — and in with the new! …In with the new toilet! 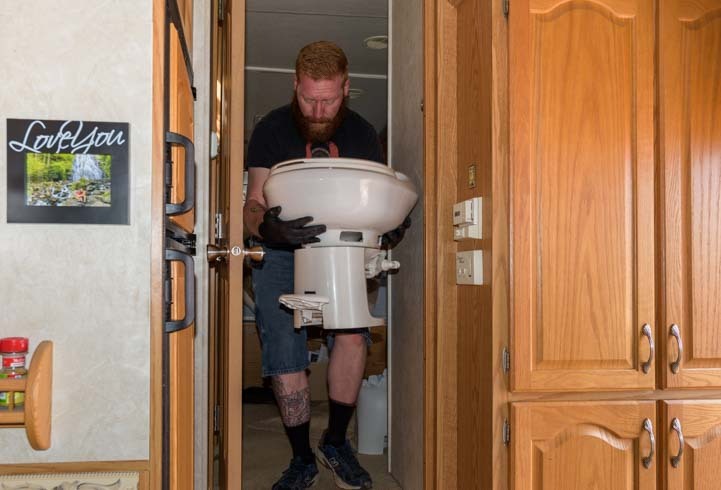 To install the new RV toilet, the process was repeated in reverse. 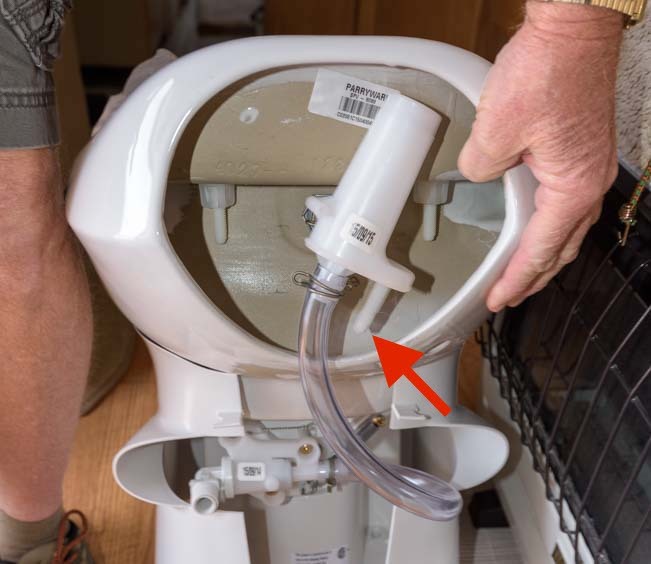 First the toilet was positioned over the black tank hole, then the fresh water line and the fresh water spray wand were reattached, and finally the RV toilet was bolted to the floor. 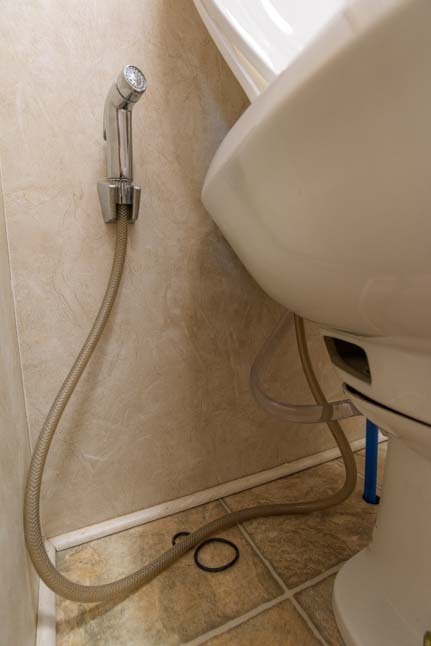 Since the spray wand is an option, the toilet ships with the barbed hose fitting it slides onto sealed shut. So, before sliding the hose onto the barbed hose fitting, the end of the fitting had to be clipped off. 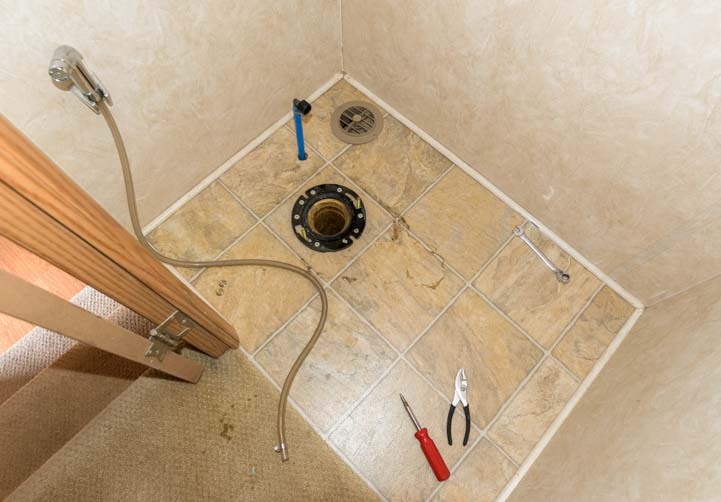 In order to attach the rinse sprayer, the hose connection must be clipped to open it up. Sprayer and fresh water flush lines attached. 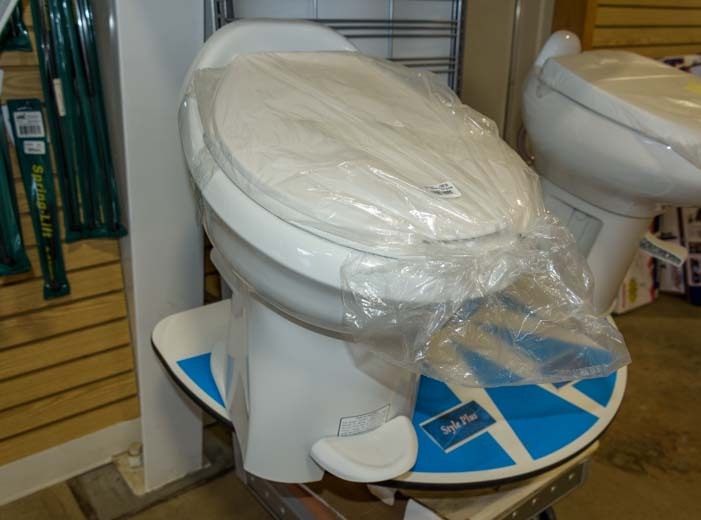 And then the installation was finished and our sparkling new RV toilet was all ready for its first Royal Flush! 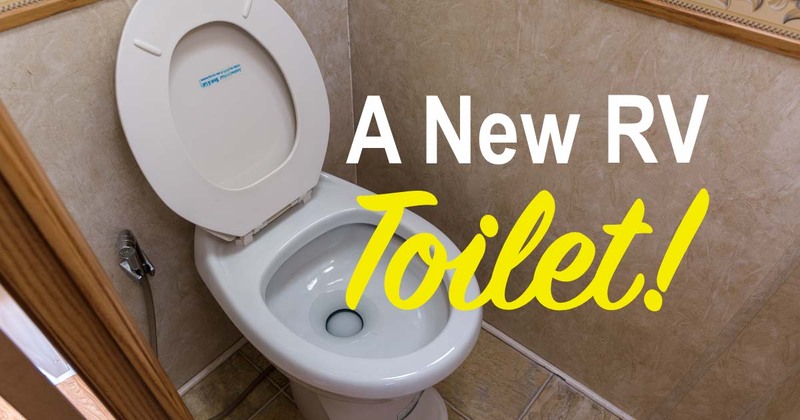 A nice sparkling brand new toilet. Yay! Our trailer warranty has paid for itself 3.5 times over! Confused about the nitty gritty fine print buried in RV Extended Warranties? Here's an excellent detailed explanation!! The $50 discount comes off of the quoted price at the time of purchase — just be sure to ask! Other Plumbing and Black Tank Articles! 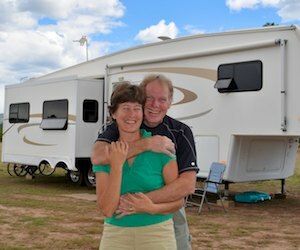 This entry was posted in The Full-time RVing & Cruising Lifestyles and tagged Full-time RV Lifestyle, New, Non-Travel, RV Tech Tips, RV Technical Topics, RV Tips Repairs, Trailer Tech by Roads Less Traveled. Bookmark the permalink. Based on your previous comments, I purchased a warranty through Wholesale Warranties in Dec 2015. Since that time, repairs to axles, bearings and wheels (complete replacement due to bearing failure), and the hydraulic system have basically paid for the cost of the warranty. I am only 18 cents in the hole so far and have a year and a half remaining on the warranty term. Great advice! You definitely made a good decision buying that warranty. How old was your 5th wheel when the warranty was taken out? It is a 2007 model, so it was 7 years old. Age 8 was the beginning of our big problems! Although we haven’t done a lot of long-distance RVing yet, I have been following your blog for quite some time. We purchased the warranty from Wholesale Warranty shortly after we bought the RV. So far, we haven’t had to use it but I am sure the day will come and we will be very glad that we have it. It looks like this is the year – finally – that we will get to do some long-distance travel. I have to ask, was that little sprayer there when you bought your RV or is that something that you & Mark installed? Either way, it seems like a great idea. Thank you for following, Gladys, and enjoy your travels! The little toilet rinse sprayer came with our rig when we bought our trailer new. It is a great idea and we use it all the time. We were really surprised when the service manager told us it was “old fashioned” and that new rigs typically don’t have them any more! It is so much nicer to let someone else do the dirty work. But Mark still lent the RV tech some of his tools because Mark’s were handy and it spared the guy from running in and out of our rig to his toolbox across the parking lot in the repair shop a few times!